Product prices and availability are accurate as of 2019-04-22 20:58:30 UTC and are subject to change. Any price and availability information displayed on http://www.amazon.com/ at the time of purchase will apply to the purchase of this product. The 3B Scientific Chemistry Cocktail Set for mixing drinks and entertaining includes two glass beakers, one glass flask, one shaker-shaped plastic drink container with base, strainer and lid, and comes with a glass stir stick and metal holding rack. The two glass beaker-shaped containers and flask have exterior warning markings to replicate an authentic chemical-mixing experience. The metal holding rack contains drink vessels to prevent spilling and provide organization. 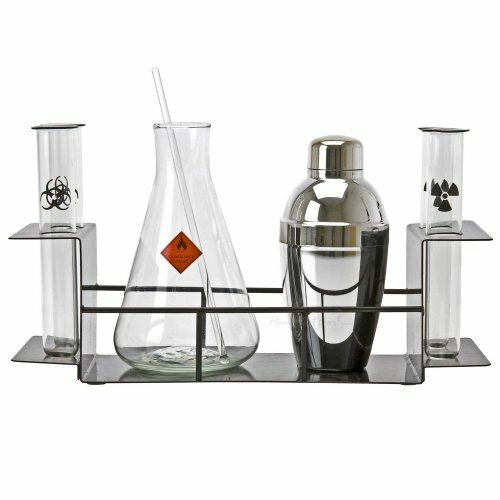 This chemistry cocktail set is used to create a festive experience for holiday, party, and personal entertainment. 3B Scientific manufactures anatomical models, simulators, charts, and other training materials for use in scientific, medical, and patient education. Founded in 1948 and headquartered in Hamburg, Germany, 3B Scientific meets ISO 9001:2008 standards.